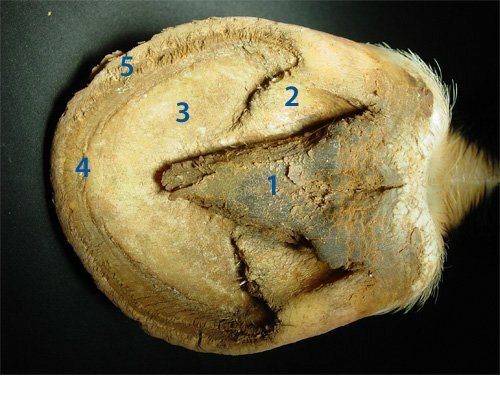 This is the first of many pages displaying horse hoof anatomy pictures. My goal is to begin with the basic external parts of the hoof and progress to the internal workings of the foot. I want to help you visualize everything in the horse's hoof, understand the relationship between the parts and learn to read the clues the hooves have to offer. The horses' hoofs are an amazing structure. By just observing the feet, you can learn a lot about the horse. You can see evidence of his conformation and how he moves by the way that his feet grow and wear. General health and the horse's environment will leave tell tale signs on his hooves. I am starting with very simple labels and will cover each part in depth on subsequent pages. 1. Frog- This is a rubbery wedge shaped structure positioned between the bars. 2. Bars- There are two bars on each hoof. They are on either side of the frog. 3. Sole- The sole covers the bottom of foot. 4. White line- This is actually inter-connected lamina that you can see. 5. Walls- Walls are the same basic structure as your finger and toe nails. 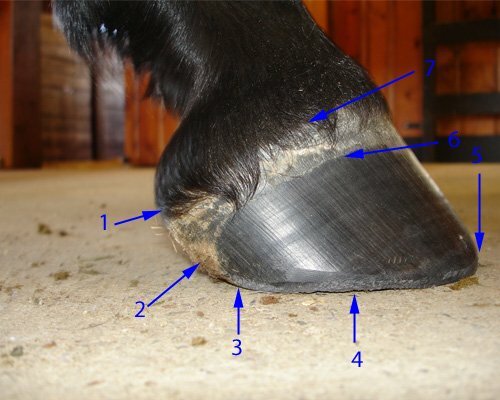 As you read and learn about horse hooves, you will see many references to the toe, quarters or the heels. Most professionals refer to these different areas as regions. 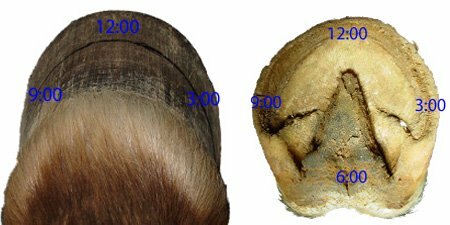 An easy way to understand the different areas of the hoof is to imagine a clock. The frog is always pointing to 12:00 or the front of the foot. The toe region is generally thought of as the area between 11:00 and 1:00. The quarters are roughly between 8:00 and 10:00 on one side and 2:00 and 4:00 on the other side of the hoof. The heels usually are around 7:00 and 5:00. See what lies beneath the hoof wall and sole.